Regular one-to-one time with a caring volunteer helps kids shine, inside and outside the classroom. 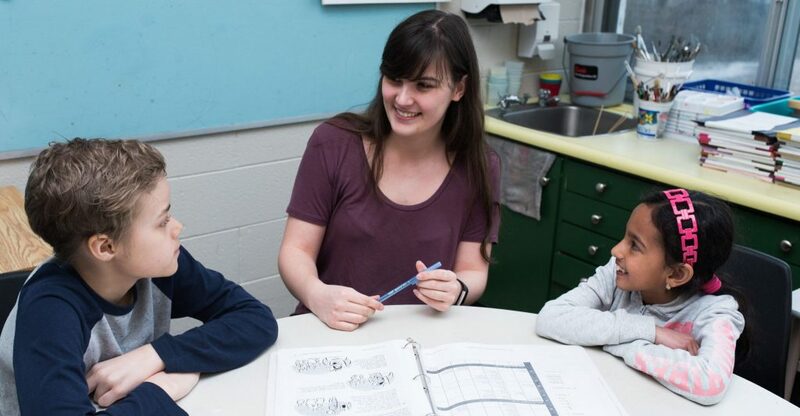 The Ottawa Volunteers in Education (OVIE) program brings volunteers from the community into classrooms, to help educators ensure the academic success and well-being of their students. Volunteering is fun and rewarding. Volunteers get to witness the moments when a student learns a new concept, reaches an important goal, and grows their confidence in a school subject. Volunteers join a community of like-minded Ottawans who want to make a difference in their city by supporting public education. They receive special training, regular check-ins, and other ongoing support from OVIE along the way. Volunteering with us is flexible, and we have a variety of opportunities to fit with your schedule. More information on how OVIE can help you! Approximately 15% of students in every Ottawa classroom have learning challenges, and may be at risk of falling behind their peers in school and becoming part of the 13% of students that do not complete high school. Additionally, many refugees, new Canadians, and Canadians for whom English is an additional language, start school without pre-literacy skill, and/or need additional English language learning support. Each year, we place close to 1,500 volunteers in 150 Ottawa schools. They provide vital support to students to help meet their complex needs. Together, with teachers, our volunteers help students build core skills, grasp new concepts, close learning gaps, and develop greater self-confidence. ONFE’s ability to respond to the immediate and ongoing, complex needs of educators and students is an important piece in removing barriers that inhibit learning. The Ottawa Volunteers in Education program ensures that all youth have the chance to finish school with the tools, knowledge and skills they’ll need to complete their studies and go on to fulfilling careers. Some helpful links to ensure you have a great volunteer experience. To review all the options, click the button below. Support us in recruiting, screening, and training volunteers to provide much-needed one-to-one support for students with learning challenges. Your contribution helps us to support volunteers, teachers, and students alike. Working with children and youth is deeply rewarding, and we have many ways for you to get involved! Your donation today will set the stage for student success tomorrow. Your gift will help address critical issues facing children and youth, remove barriers to learning, and prepare local students for post-secondary success.